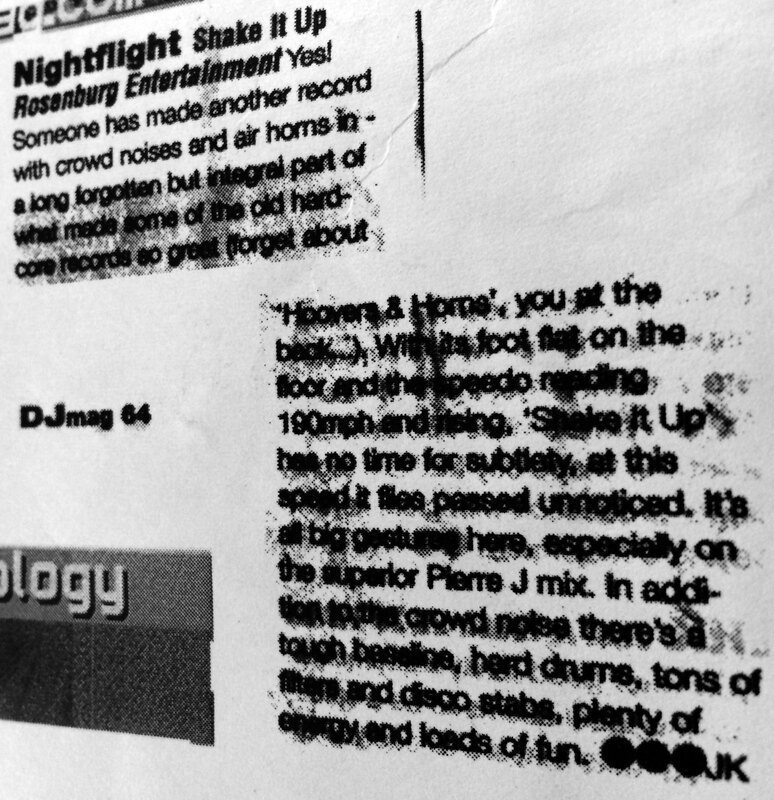 In the autumn of 1999, my single “Night Flight – Shake It Up” was released and now a license request from an English record label came. They signed it and wanted to release it when I asked if they wanted a mix as “English-inspired real club music”. Yes, of course. 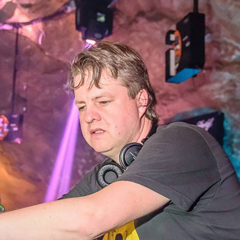 At this time, Olav Basoski was very hot and made house music in 130-133 BPM, that went to crossover to a wide range of DJs. And some stuff even ended up being played by techno DJs or trance DJs. I would now try to do the same, create a sound that would apply to many and the Pierre J’s “Funked Up” Remix was born. The song was released in England and I can proudly say that the last Carl Cox played last millennium was “Night Flight-Shake It Up”! My song in my new remix, which then goes into a countdown. The place is Sydney in Australia and the mix is ​​also broadcast as “Essential Mix” on BBC Radio 1. 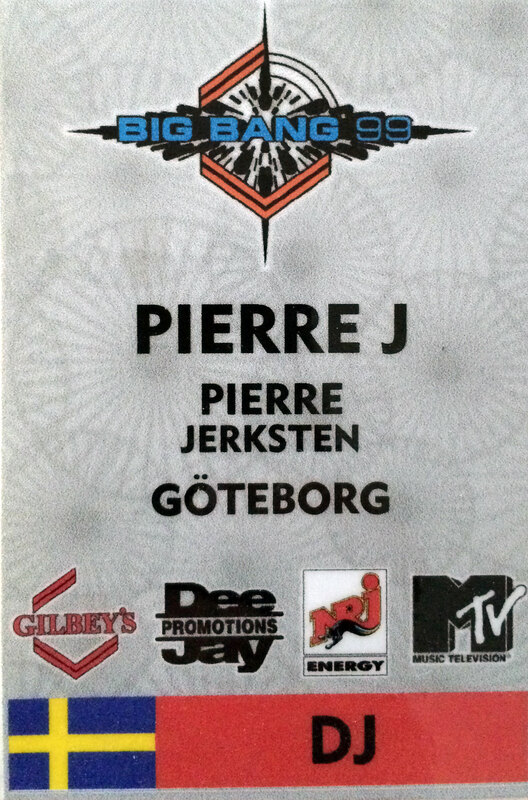 Even Judge Jules and Pete Tong play it in their shows and for the first time it seems to me that my stuff does not necessarily have to stop being Swedish local achievements, because I can actually do stuff that even the world-wide DJ stars can and want to play. Record-release number 165 ready! 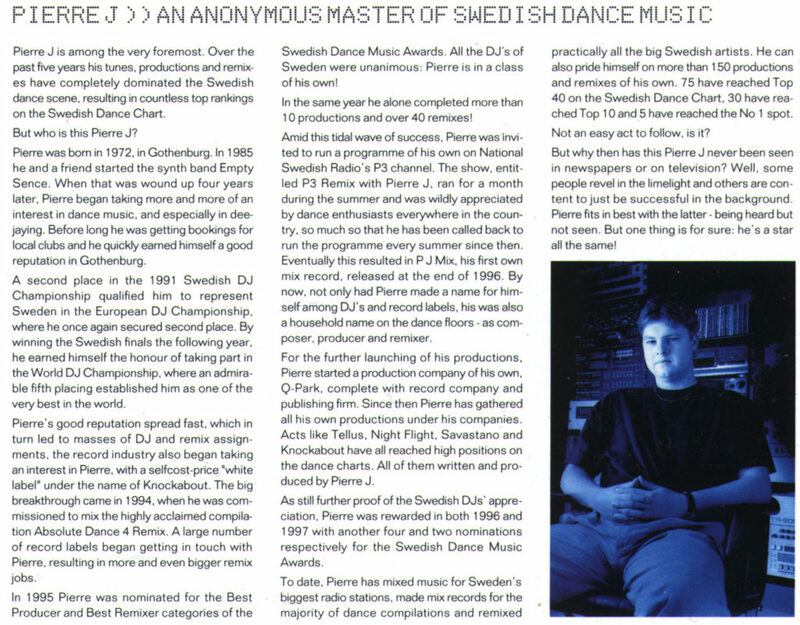 Stockholm Records made a smart move when they hired a DJ from the biggest radio stations P3, NRJ and Power to do their megamix. And then the safe card, me 😉 That way, all channels would have their own mix to play and even DJs had a lot to choose from. 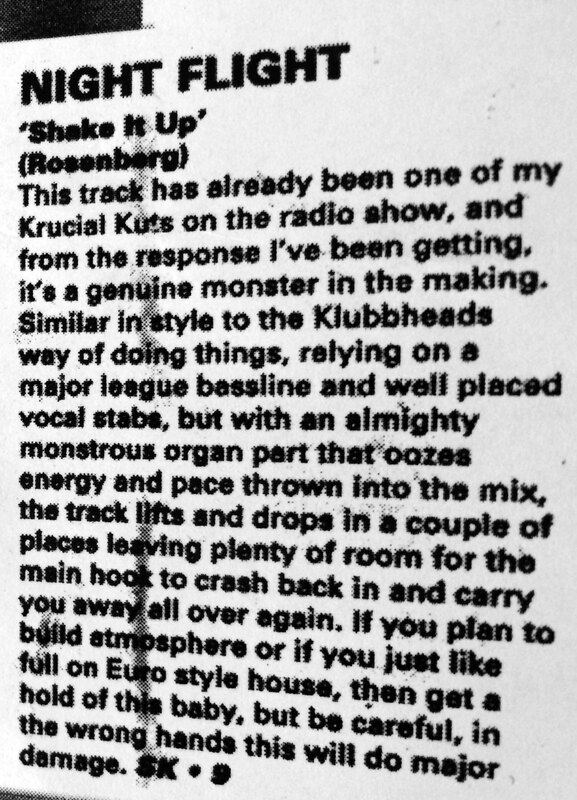 I had earlier made an E-Type megamix a few years earlier, but now he had released additional songs and I split it into two parts, the first with house that then floats over in his typical eurodisco style. In England, Pete Tong had his show on BBC Radio One, where new dance music was played, sometimes in mixed form. In Sweden at the national radio level we had P3 dans, which featured varied club music, rarely mixed and with a huge variety of genres. We also had P3 Mix, which was much more commercial in their music selection. Besides that, there was probably only NRJ, which, in spite of that, played mixed music in the evenings sometimes, but was only available as a local radio in larger cities. Here I saw a huge gap to fill and an opportunity to submit a program proposal for a separate program. In the summer of 1999 my proposal was sent to P3 and after a while I received positive feedback. My first thought was, wondering who should lead the show in regards to do the talking? It may sound like crazy, but I did not see in front of me that I would host the program with my voice, but soon realized that if I did find anybody else, that task would be on me. Ok, I’ll try. Because the idea of ​​the program was that the music should be in focus, and I myself was looking for a program where amazing music was played non-stop without having to be interrupted by talking all the time, I saw my role as an informant about what had been heard rather than host. As a preparation and test of me, before the whole program was approved, I would do a test broadcast. 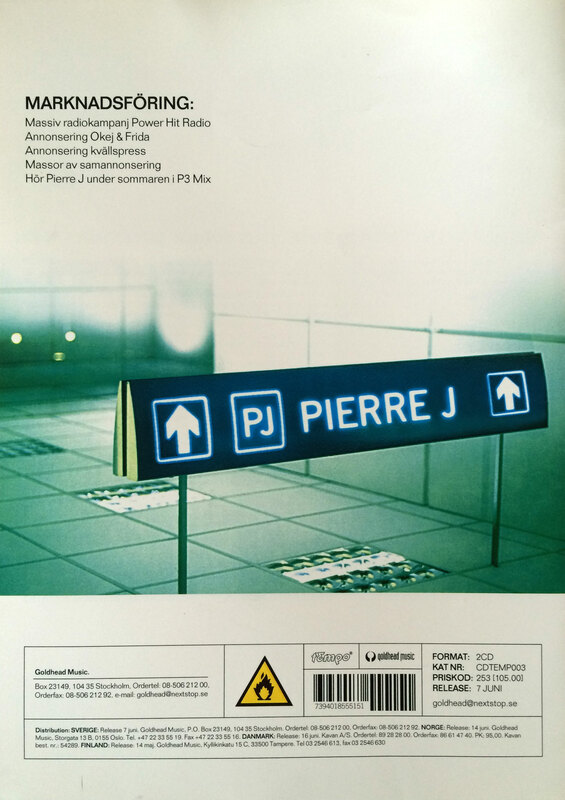 I would send 4 hours P3 Mix on October 22, 1999 from Växjö. I was really not ready to lead a program of 4 hours. My programs would also be done at home in my studio, and not live in any live broadcast. Sound technician for P3 mix was still Magnus Larsson, as I learned well, and we agree that I’m running a lot of the program pre-recorded. So I did a lot of talking and burned on CD, along with some pre-recorded mixes that are also included on CD. But we also do a part of the production in Växjö, including an interview with Antiloop and one with Stonebridge. Then I actually broadcasted the last hour of the show completely live. The program went well and I was most pleased to have survived the night without any major mishaps. After that, the positive message was that I would have 2 hours of programming time all by myself every week for a year. There was no big budget, but I thought this would be my chance to create something unique in Swedish national radio. More about it in an upcoming post. Here are the interviews with Antiloop and Stonebridge. Pierre Jerksten, Andreas Johnson and the singer from “Fudge” participate in a live broadcast on National Radio P3 in the feature “Flipp eller Flopp”, a program led by Sladjan Osmanagic. National Swedish Television SVT was filming it all. This single was one out of many when released, but came to mean so much later on. Tommy and I did the usual music with a boiling dance floor in mind, and so we did again. The rest of the story is including Carl Cox, and can be read right here. 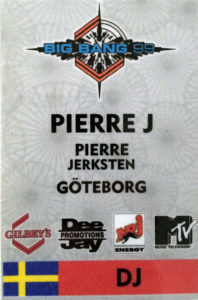 For the fourth consecutive year, it’s time for P3 Mix to turn into P3 Remix with Pierre Jerksten. The program offers lots of popular music in all genres and very special mixes you could not hear anywhere else. I also create new versions of songs using acapella-versions. There is a lot of work behind these mixes! After 5 years of work for all possible record companies and over 150 released productions, songs, remixes and mixes, this disc came to sum it up. Here’s the most you need to know about what I’ve been involved in during these years. Of course not everything but a lot. 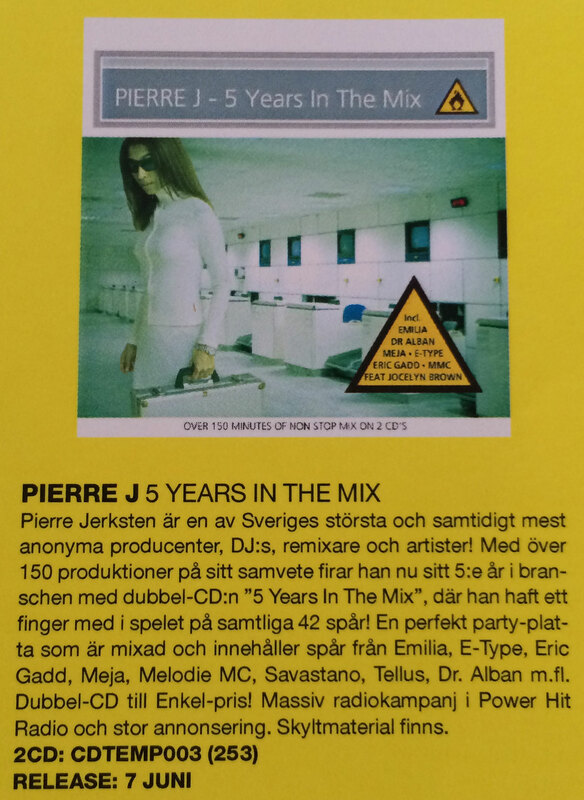 Many of the songs had topped the Swedish Dance Chart and I am delighted to look back on these years of such an intense and fun jobs. After playing at Trädgår’n for a whole year, and doing several jobs a week throughout the period, Trädgår’n thought that they would manage to take care of the DJ-bookings themselves.Just after I finished, I thought I could record two CDs with songs that rolled a lot during the spring. This is definitely not the World Cup in mix, but very simple live-mixed at home with a denon CD-player and a mixer without filter. 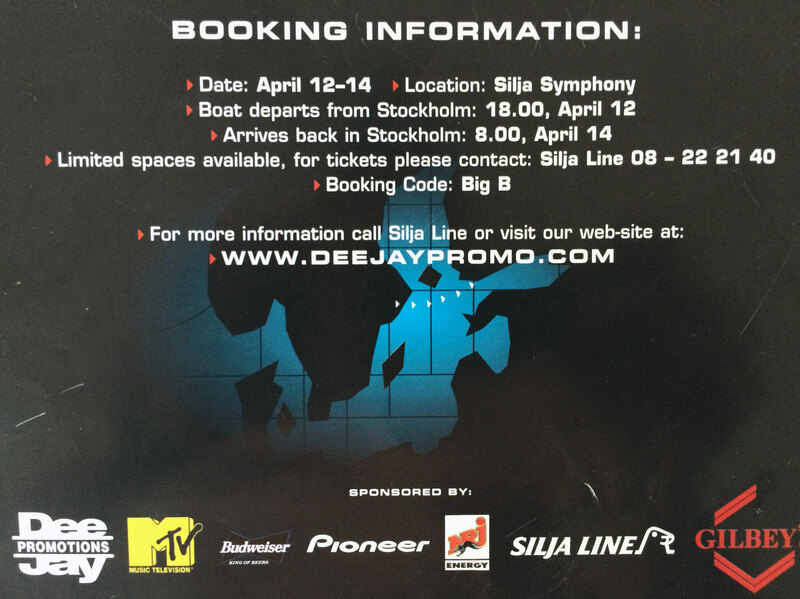 As for Trädgår’n, it became a break for almost 2 years, before I returned as a DJ-booker, when they realized that it became unsustainable to have no one who ruled a music profile. A*Teens was initially called Abba*Teens but was forced to change due to copyrights. The music was Abba covers in new euro-inspired versions. Although the whole idea of this music felt a little uncomfortable at first, it became a huge success. In addition to medley, I also made 2 remixes for the project. 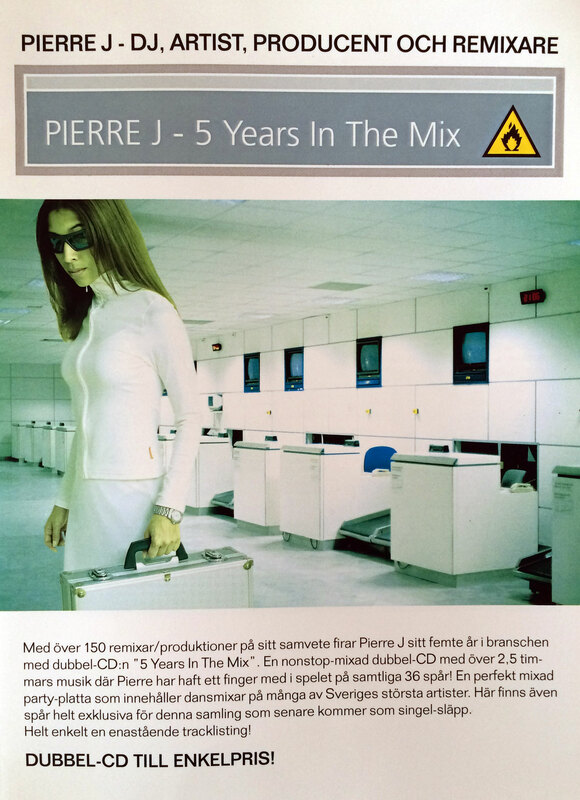 Tommy and I created this song quite flatlessly, but I thought it was pretty good, so it ended up on the upcoming collection “Pierre J – 5 Years In The Mix”, in addition to joining a promo-CD “Big Bang” in an edited version. This is the first time you can hear the song in its entirety and as a bonus, the edited version is included. 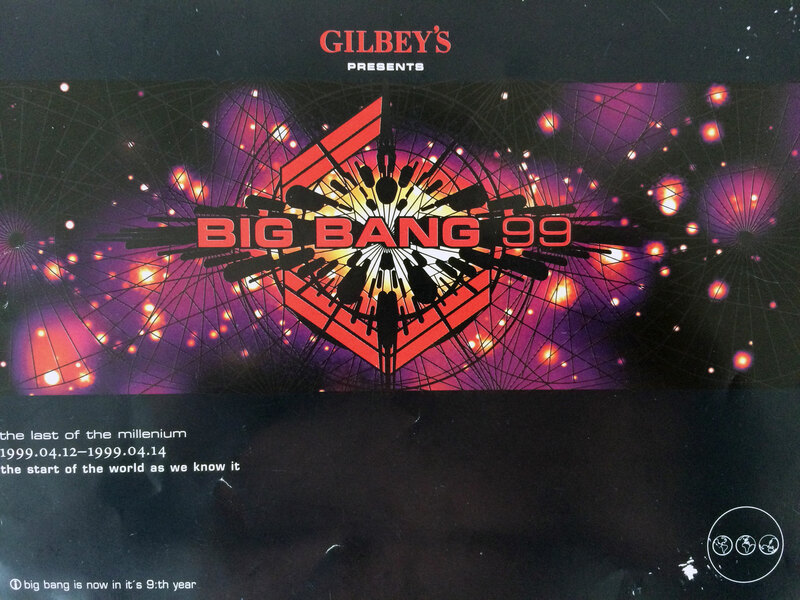 I also played as a DJ on boat-event Big Bang, in good company.